Felix, Stewart Fan, (deleted member) and 1 other person like this. JJ Yeley will be driving this car at least in the Daytona 500 but they wanna run the entire schedule. Short track r us, Benevolent One and dpkimmel2001 like this. Sad that buy-a-ride carries so much power these days. Brad K made it by skin of his teeth. There'd be no Big E/Harv/JJ with current trend. Did somebody screw up on the second car? Not enough room to put the 5 in front of the 1?Or is it a Nationwide car? "WHAT THE HELL DID YOU M'FERS DO TO MY CAR?" They are just making sure Kurt gets in the right one. NASCAR has conceded the inevitable. 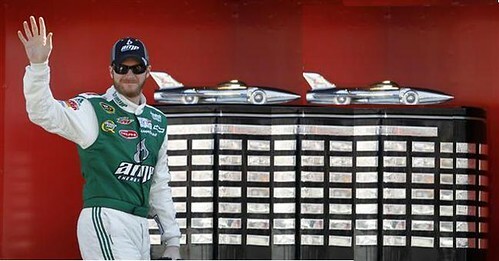 Here's the redesigned Harley J. Earl trophy for the 2012 Daytona 500. Perhaps they will add steam to the back car, just to keep Mike happy. Judging by the sidewall, I would say they are Goodyear Wrangler speedway set-up tires. Benevolent One and (deleted member) like this. Let's hope Robby runs more than 3 laps if he makes the 500. Ryan Newman's contract is up at the end of the season. Says he'd like to stay at Stewart-Haas but also wished an extension was done already. Who is Tony going to get that is better than RYAN? Or wait, it's about money, sorry. Maybe Ryan won't have a job. Danica Patrick, Driver of the #10 Chevy, channels her inner Harry Caray during Daytona Media Day on SiriusXM NASCAR Radio. Kurt Busch will be free next year. But didn't Newman outrun Tony for much of the year? I figured it had to be Buddy because of the height but I couldn't recogize him.Mark (the Kid) really looked like a kid. Failure just waiting to happen. dads318is and (deleted member) like this. Check this out..... Yesterday I get an email from Bristol Motor Speedway Charity's 'Track Laps for Kids'. They are allowing fans to take their own vehicles out on the track $25 for 5 laps. Of course, this is only at a pace speed. Kinda a cool way to raise money that has never been done to date @ BMS. We reserved a spot to do this Thursday night before race weekend. Anyhow, my son's 16th birthday was this past fall and he is to be taking his drivers test before we head on down to Bristol next month. I've already told him that we plan on having him drive us most everywhere while we're down there. I think that he's going to be shocked when we drive by the track, turn in and wait for our turn to take some laps around the track. Taking your Vette with you? The grand sport of course? Or maybe the ZR1? Can't tow the 5er with any of those. Unfortunately, it with have to be my 2008 GMD 2500HD Diesel. It will be memorable all the same. That's great dpk. Be sure to post a picture of you waiting your turn while giving the official a proper Kyle Busch salute. I can tell you that this is probably not what I'm going to be thinking about when we go rolling on to the track. And, it obviously isn't the best example for my entire family, that will be riding with us, including my wife and daughter. At the same time if I'm able to pull it off I will. I see your point. Perhaps you can pull off a very mature 'what not to do' lesson for the kids. How gullible is the wife? Yeah, I'm sure that'll work. She is taller than her cutout. Lake Loyd is about as centrally located to the Daytona Speedway as you can get. Anyone know who this young driver is? Maybe not for everyone but great pic none the less. Cars back on track tomorrow at noon! Danica's souvenirs after attending the the National Press Club and Pardon the Interruption this morning in D.C. the morning.